After Trevor Upton started showing movies at the newly built Town Hall, the Gladstone Theatres Ltd opened the Embassy Theatre on the 2nd November 1935, This was built along with a nest of shops between the Royal Hotel and the Commonwealth Bank. This theatre boasted seating of nearly 1000 patrons and it was lavishly decorated. Gladstone Theatres Ltd closed down the Lincoln Theatre and their manager, Stan Clapham, became the manager of the Embassy and a few years later he bought the Embassy from the group. Gertie Ward provided piano accompaniment, three times a week, for the silent pictures at the Embassy. The Royal Hotel changed hands many times from 1925 to 1947. In 1947, Charlie and Vera Duncan had just bought the license of the hotel and had travelled up from Eumundi to sign the papers. On returning home they were greeted with the news that the hotel had burnt to the ground. The owner of the building at that time was J Lawrence from Rockhampton. The fire started in the Embassy Theatre, three doors up the hill in Goondoon Street and it quickly spread to the surrounding shops. 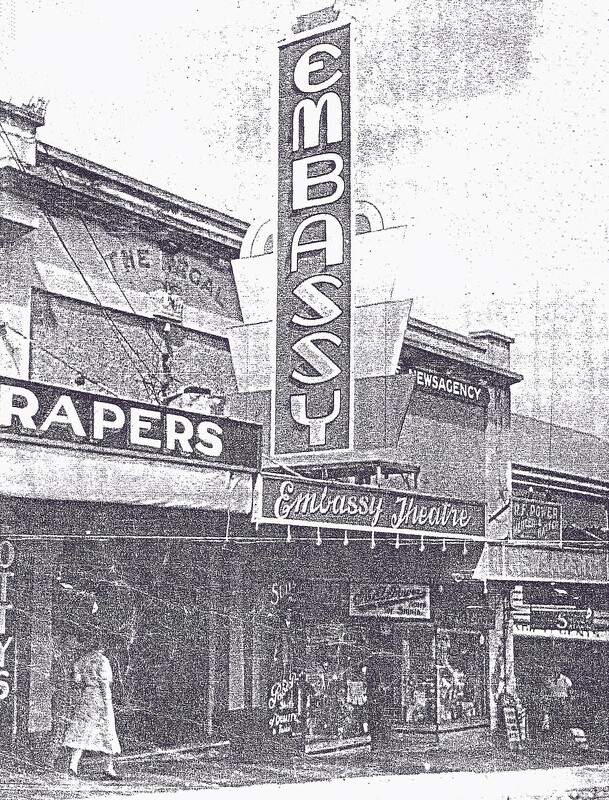 The businesses destroyed were the Embassy Theatre, the Embassy Cafe, Power’s Menswear Store and a Newsagency. Much of the Royal Hotel was badly damaged and it was also forced to close down.